Jessie joined the VIU Faculty in the fall of 2012. 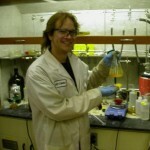 He has previously taught Organic Chemistry as a sessional lecturer at UBC-Okanagan and was an instructor for Academic Upgrading and Chemical Technology at the Northern Alberta Institute of Technology (NAIT). Jessie’s main area of interest is Chemical Biology; with a focus on fluorophore synthesis, labelling and bioassay development. Jessie is currently teaching first year (Chem 140 and 142), Engineering Chemistry (Chem 150) and Organic Chemistry (Chem 231 and 232). He has also been conducting research on video tutorial effectiveness for chemistry laboratories. Jessie has worked with the BCcampus Open Textbook project as a reviewer, author and Faculty Fellow (http://opentextbc.ca/introductorychemistry/).